Demi Moore said the weather in Wales was "challenging"
People who took part in the filming of Demi Moore's new film, Half Light, were given the chance to attend its UK premiere at Holyhead on Sunday. The romantic thriller was shot over several months in and around Newborough as well as at locations in Gwynedd. Anglesey Council said the island's economy had benefited by around £1.5m as a result of the film coming there. The 43-year-old Hollywood star did not attend the premiere at the Ucheldre Arts Centre. And one extra who was in the movie, Meirion Williams, said he would not be going to see the Hitchock-style thriller as it would be "too scary". "I enjoyed taking part as an extra but the experience was not new to me as I do work as an extra for local film companies anyway," said Mr Williams, who with his brother John, played the part of twin brothers. 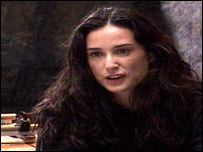 Demi Moore plays the role of the main character, Rachael Carlson, in the film. The actress said one of the most memorable things about filming in north Wales was the weather. "It was very challenging because of the wind," she said. Half Light's writer and director, Craig Rosenberg, also said the weather had made it difficult to film. But the "windswept and romantic" effect made it worth it in the end, he added. Anglesey Council's leader Gareth Winston Roberts said it was estimated that the filming brought in around £1.5m to the local economy. Before the screening he said: "I'm very much looking forward to seeing how locations, like Llanddwyn, which are familiar to many of us, will look up there on the big screen." The film makers came to the area after meetings were set up by the Wales Screen Commission. 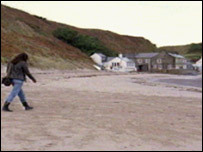 Part of the film was also shot at the National Trust-owned village of Porthdinllaen on the Lleyn peninsula. There will also be a public preview showing of Half Light on 20 June at Ucheldre arts centre, Holyhead.